[miau] There are a lot of cool and tremendous slot machines out there. Many are based on new movies and popular culture. What about a classic, simple style of slot machine that offers familiar images and not always things straight out of Hollywood? The Zhao Cai Jin Bao Slot machine would fit the bill. As the name suggest, this is a slot machine based on Chinese cultural heritage and iconography. Illustrated English letters on the screen are done in a manner similar to Chinese calligraphy. There are historical figures from Chinese culture along with images from the Chinese zodiac on the screen. The careful detail that went into the crafting of these images is truly a sight to behold. The colors that went into creating the visuals definitely enhance the experience of play immensely. Traditional style Chinese music is played before, during, and after the spins although the music is sped up a bit to make it bit in with what is to be expected from a slot. Of course, looks and sounds are not the only things people are going to be interested in when they hope to press their luck at a particular online slot machine. You won’t be disappointed if you are looking for a solid chance at winning. There are nine paylines and three rows of icons. This allows for quite a host of combinations to potentially turn up. The various combinations definitely open the door for winning big. At the very least, you could end up with a few free spins capable of boosting your earning potential at the slot. One of the most interesting aspects of this slot is that you can win from combinations that emerge from left to right and from right to left. As a result, the possibilities to win are much higher than what would be the case with a host of traditional slot games. If you want to go for low stakes, you certainly can do so since the minimum amount on the slot is .01. The maximum total stakes you can enjoy with all the paylines added together is 100. 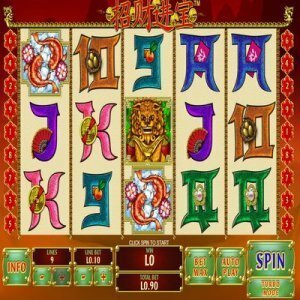 The payout percentages on this particular slot is higher than what you would find with the average slot game so consider Zhao Cai Jin Bao to be one of the most lucrative of the slots available. The jackpot payout is maxed at 5,000 coins and that really does add up. Anyone lucky enough to hit that jackpot is going to walk away very happy. Designed by PlayTech, the Zhao Cai Jin Bao slot machine really is a winner. Why not give it a try and see how well you do?